Consulting the 1876 Whipple fire insurance maps, that are available online from Washington University and the Missouri History Museum, I found both the three story building, listed as "Central Warehouse A", and the adjacent one story warehouse to the south, listed as "Central Warehouse B". 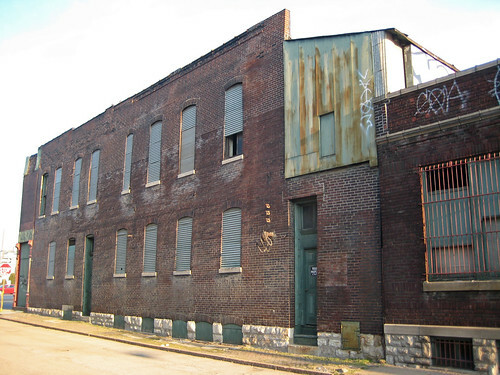 Just north, the surviving three story warehouse hat has the large corrugated sheet metal structure perched on its roof also appears to be on the 1876 map. The buildings are in the upper right portion of the map above. Other than a few small buildings surviving on 4th Street, the only other structure extant from the 1876 map is the St. Mary of Victories Church and adjacent school. The church is by far the oldest structure in the area, having been constructed in 1843. The warehouses along 1st Street, or Main Street as it was called at that time, must have been constructed right around 1875-1876 because they do not show up in Compton & Dry's aerial view of the area from Pictoral St. Louis, which was published in 1875. By the time this 1909 Sanborn map was published the giant Crumden Martin complex by architects Mauran, Russell & Garden was taking shape a block south between Cedar and Gratiot. The buildings shown above had been built between 1904 and 1907. The building that partially burned just over 2 years ago, and still stands roofless would be built three years later in 1912. 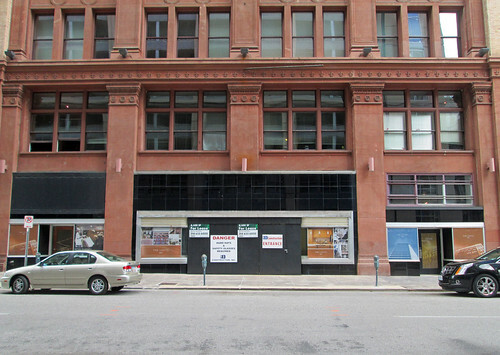 The Powell Square Building, which was built for Milliken Pharmaceutical in 1916 a block west at 217 Cedar, was wastefully demolished by the City of St. Louis early this year. The Crumden Martin block would be finished out at Cedar & 2nd in 1920 with the construction of a crenelated concrete structure designed by Tom P. Barnett. Central Warehouse A and a smaller portion of Central Warehouse B would later survive partial demolition for a railroad trestle that connected existing alignments allowing trains to turn south from the central rail yards south of Downtown to the trestle running along the riverfront. I am unsure of the date of construction of the trestle, but it shows up in an aerial view from 1958. This view from 1st Street at Cedar shows the small portion of Central Warehouse B that remained after the trestle construction. As was common in the first half of the 20th Century, the testle construction took only what was needed from the larger Warehouse A building, and constructing a new board formed concrete wall to close up the building just a few feet from the trestle. 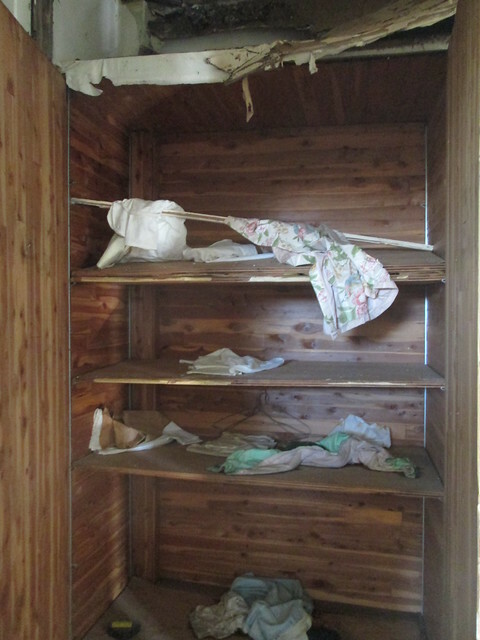 Ann Aurbach has posted about a dozen photos of the grizzly aftermath of the recent fire that finally destroyed both Warehouse A and B on her blog Biscuits with Honey. What ultimately happens to this site and to the larger Chouteau's Landing district remains to be seen. 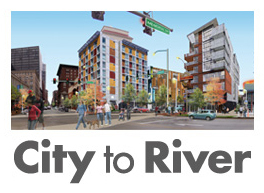 The district's remaining historic buildings and growing stock of vacant land hold great potential with a location immediately adjacent to Downtown St. Louis, the Arch grounds and the riverfront, which will soon be vastly improved with a new bike and walking trail currently under construction by Great Rivers Greenway including a trailhead at the foot of Chouteau Avenue. 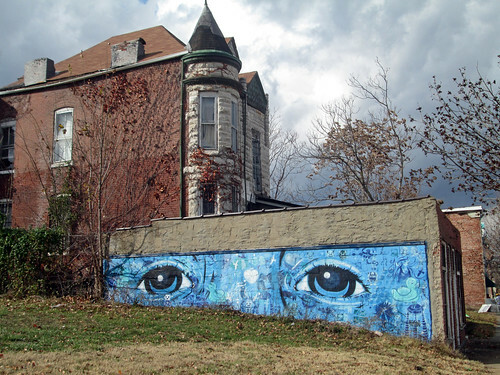 Despite these assets the district remains gravely isolated by the urban planning mistakes of the last century and portions of MVVA's plans to revamp the Arch Grounds and connect to Chouteau's Landing have apparently been eliminated due to budgetary constraints. Needless to say, it will take some major infrastructure changes/improvements and developers willing to risk investing in uncharted territory to tap the potential of Chouteau's Landing. Last weekend I was driving out Olive Boulevard past Hanley Road and noticed that this unique building has disappeared. The interesting feature that made this building stand out was the sculpture like wall of projecting and recessed rectangular brick panels. The buildings entrance canopy was also attractive but ingeniously simple, composed of some steel tubes and a standard pair of standard double T precast concrete sections. Another view shows that what would ordinarily have bee a plain and boring windowless facade was transformed into an attractive work of art with some simple pushing and pulling of the brick face. The effect was subtle, yet more powerful due to the random pattern used. The building was somewhat oddly configured with two relatively narrow wings. The rear wing had multiple garage doors opening to the asphalt lot. Whatever business occurred back there was masterfully screened from view to the street. I do not know who the architect was, so if any reader happens to know, please share. The building was for sale last year, but apparently the new owner did not purchase for the building and there was no sign on the lot indicating what is to come as of last week. If they had been looking for a vacant site, they would have needed to go no further than two lots west to the still vacant site where the Arcade Lanes bowling alley burned in 2003. 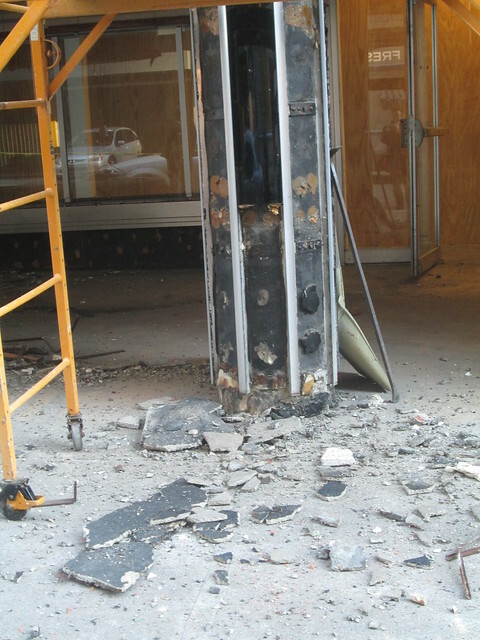 UPDATE: Yesterday A City official contacted me about this demolition. The City did not demolish the building due to the earlier condemnation as I assumed, but instead, the application came from the owner. 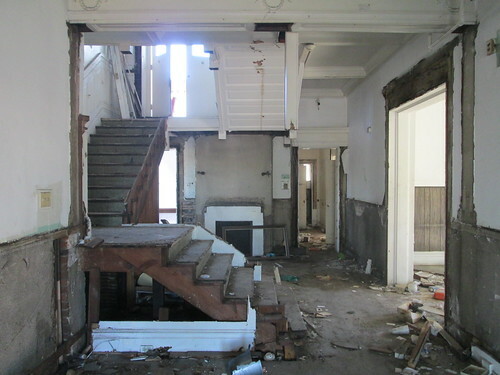 The demolition was approved without review because apparently in the transfer of information from City Hall, where the application originated to 1520 Market Street where the Cultural Resources Office is located, the address of the building was incorrectly entered. 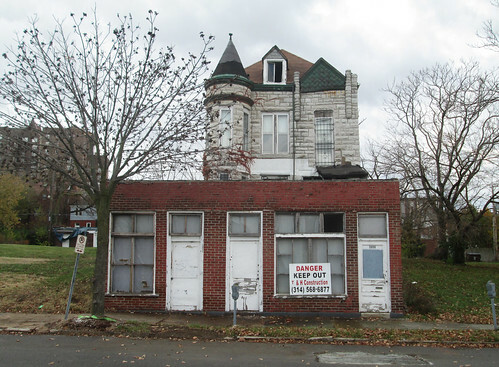 The address entered put the building outside of the S. 4th Street National Register district where the building is actually located, so CRO did not review the application. Also, it is rumored that a new owner has closed on the purchase of the property from Steve Murphy. 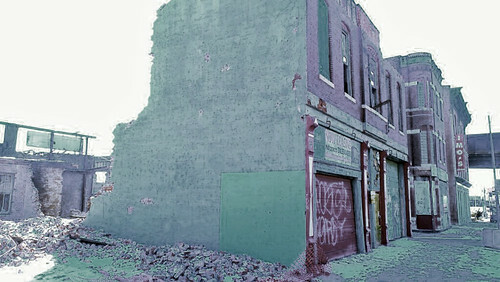 On Wednesday this photo of the demolition of 818-822 S. 4th Street was posted on Twitter by Alternative Apparel, which is part of the Collective at the MX. 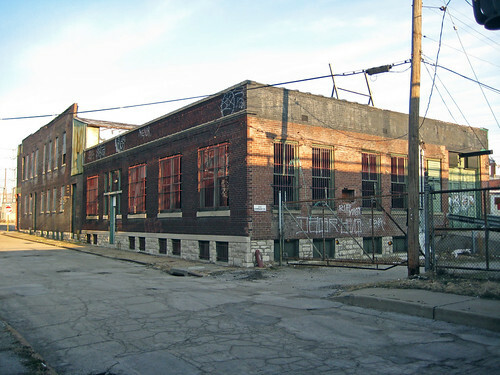 The building was located at 4th & Lombard, just north of the old approach ramp for the MacArthur Bridge, on the western edge of the now moribund Chouteau's Landing District. The building is owned by Steve Murphy who headed the now defunct Chivvis Development, which rehabilitated several buildings along 4th Street. 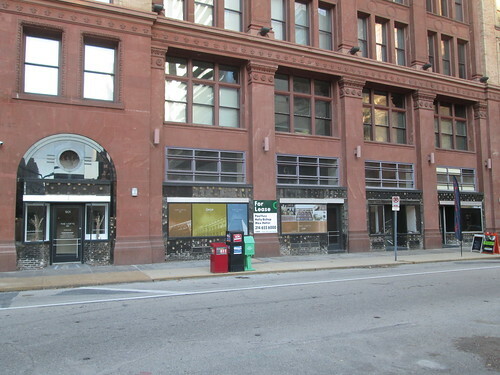 You may recall that Murphy also owned the prominent Powell Square Building which the City of St. Louis demolished at the beginning of this year. 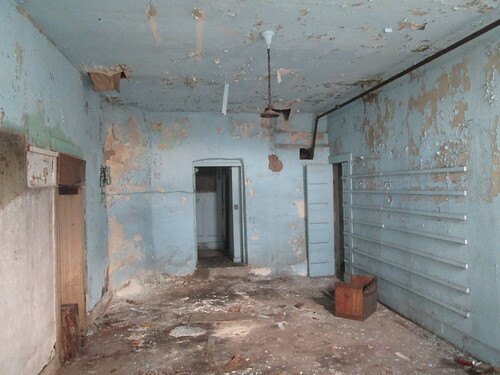 Built in 1890 for a saloon and butcher shop, the building has been been empty for many years. It was most recently known for the colorful paintings by local artist Peat Wollaeger. No news if Beardy McGreen will be saved. 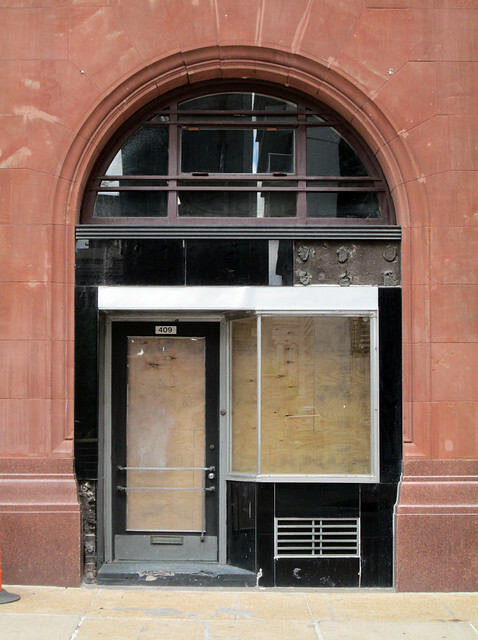 The structure was a contributing building in the South Fourth Street Commercial District, a National Register historic district that was created in 2006. A view of the building from Lombard. Earlier this year the City of St. Louis issued an emergency structural condemnation for reasons unknown. The structure at the rear of the property is a separate building that was built in 1917 as an office and warehouse for Saxony Mills, a large flour mill located across Lombard since 1849. The mill was demolished for the construction of Interstate 55. 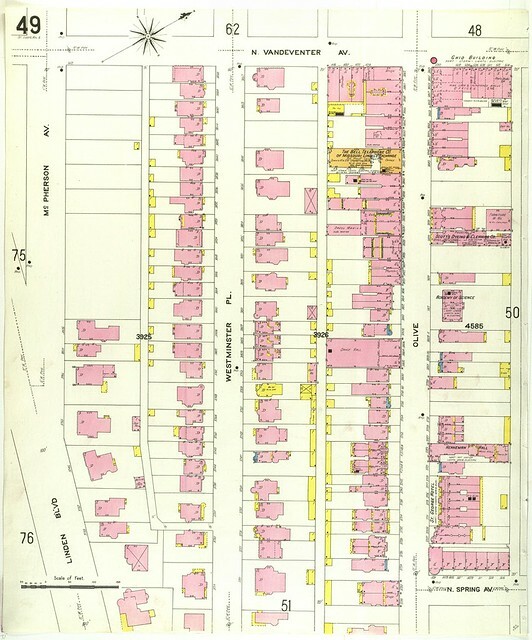 The 1909 Sanborn map for the area shows this building as a 3 story structure. 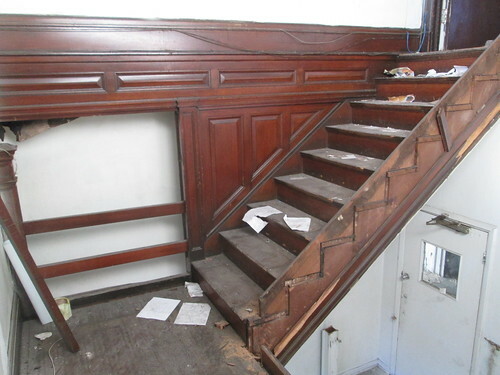 It is unknown when the upper floors were removed. Also unknown is whether this structure is being demolished with the front building. They were built on separate parcels and later combined into one property. I fear for this building because with "emergency" demolitions the City is typically not smart enough to discern that there is more than one building on a parcel, so everything gets wrecked. 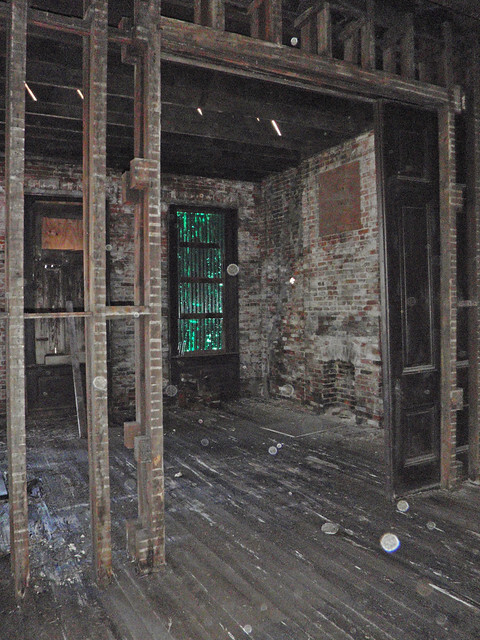 The interior of 818-822 S. 4th had been gutted down to studs. 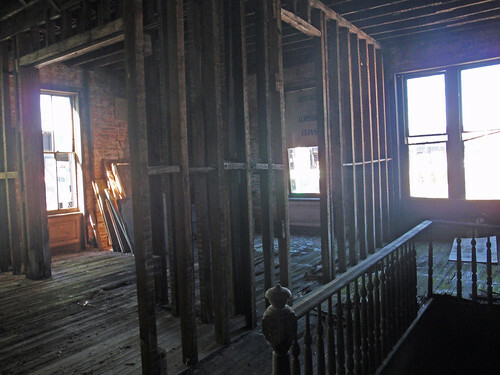 As of a few years ago, the interior of the structure was in decent shape although there were soft areas in the floors and a few isolated areas where the joists were quite deteriorated. The masonry shell was in good condition and the overall structure sound. 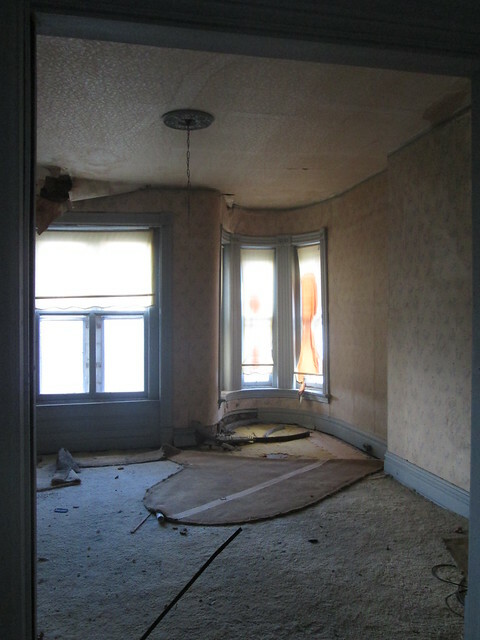 Another interior view of the second floor of 818-822 S. 4th. 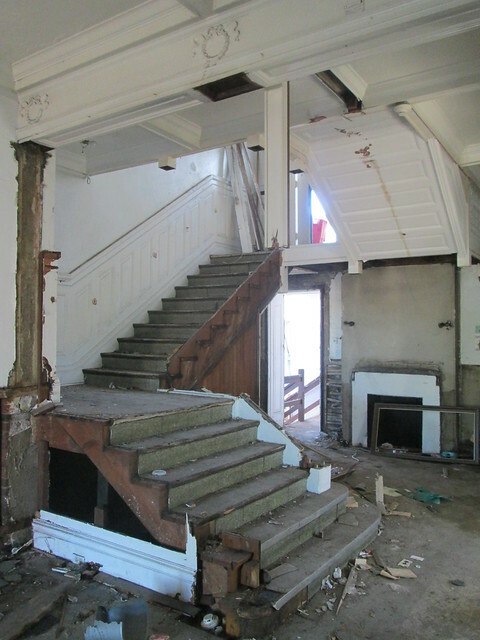 Interior view of the entrance to the building at 321 Lombard. 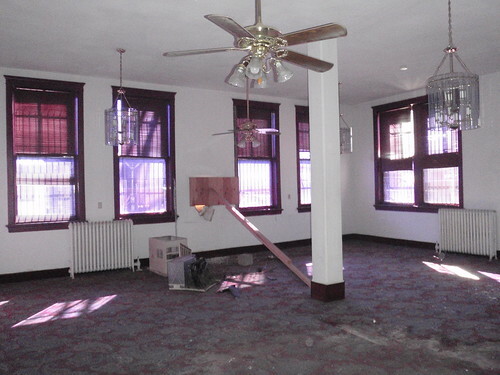 This building had apparently been used more recently than the building on 4th Street and was in excellent condition. 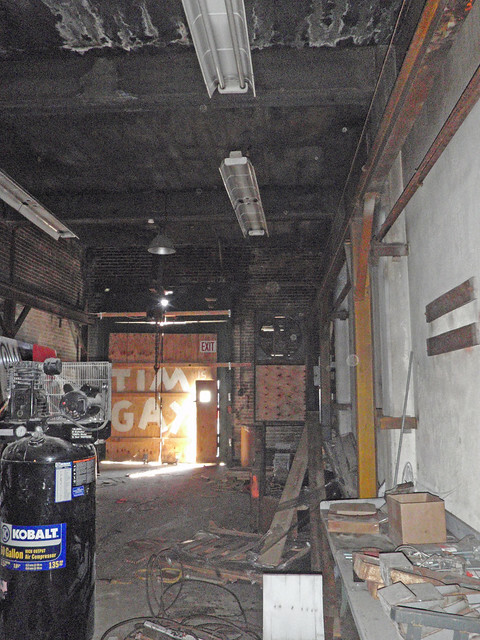 An interior view of the loading dock area of 321 Lombard at the north end of the building. The building is a concrete frame structure with brick infill walls. The buildings at 818-822 S. 4th, 317 Lombard and a small one story addition at 812-816 S. 4th are at the center of the historic district. Their loss (if indeed the entirety is being demolished) would be very damaging to the continuity of the district, which with the large gap in the middle was already fragile. 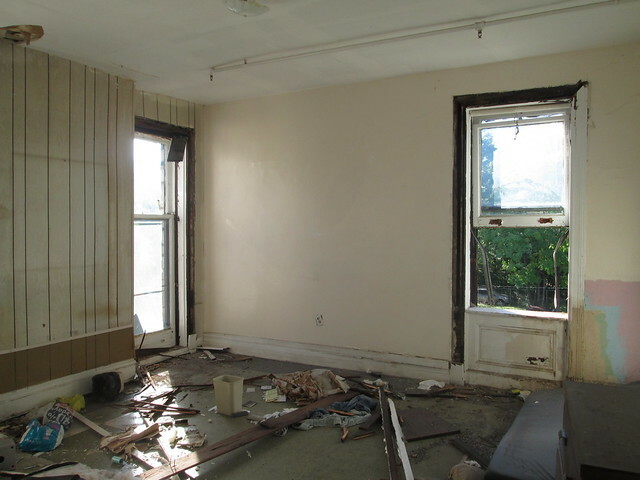 As of the beginning of last week, the Cultural Resources Office had not received anything an application for this demolition, which is likely a result of the "emergency" condemnation. If this building had begun to collapse into one of the streets, which no one has made indications of, an "emergency" action might be justified, but if this was simply another building that lost part of its roof or a section of floor to inward collapse, then we are losing another building (or maybe two) for no good reason at all. Last weekend I decided to go photograph 3808 Olive, a 2 1/2 story stone faced home with a later storefront addition owned by Grand Center, Inc. that is slated for demolition (see story by Preservation Research Office). The City's property database lists the construction year of the home as 1900. Having driven by this building many times, it never appeared that there was any obvious exterior structural issues, and there are not. 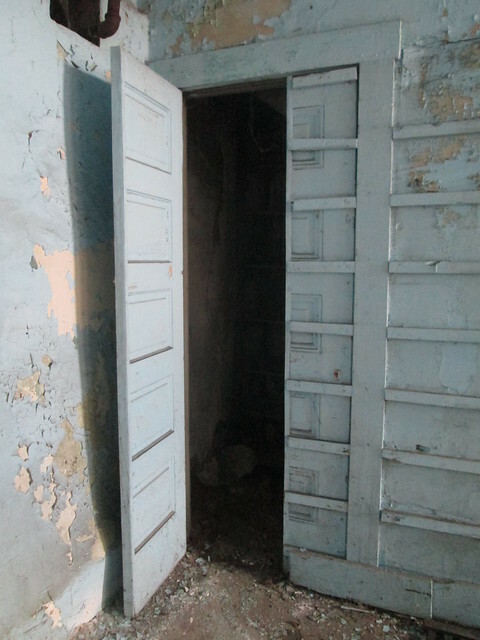 The rear basement door was wide open, so I decided to have a peek inside, expecting to see the house in far worse shape than it is. 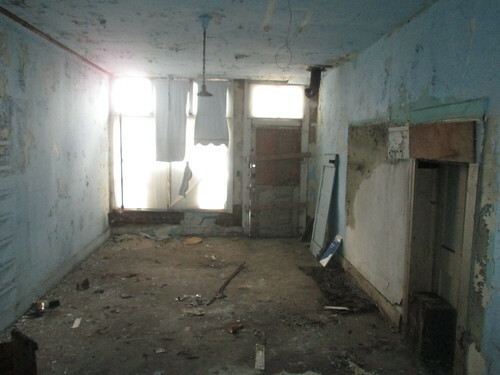 The front room of the first floor, in which almost everything is intact. The window sills had been raised because of the roof level of the addition. 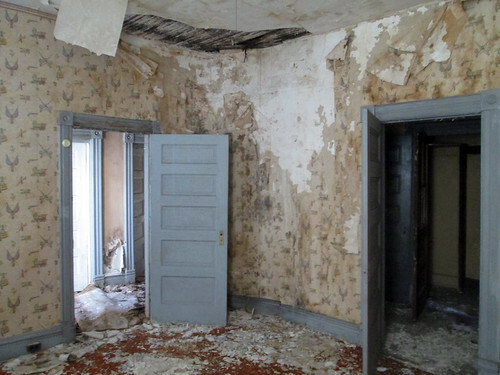 The center room and adjacent hall below show signs of obvious water damage including plaster fallen from the ceilings, but not nearly what I had expected to see. 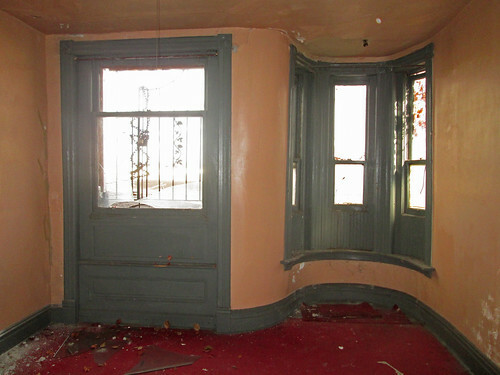 The center room on the second floor was similarly in very good shape. Room with a view. 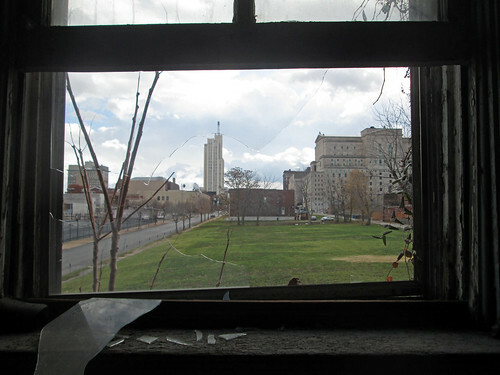 Beyond the emptiness of the vacant lots, windows on the east have nice views of several midtown landmarks including the Continental Building and the Masonic Temple. 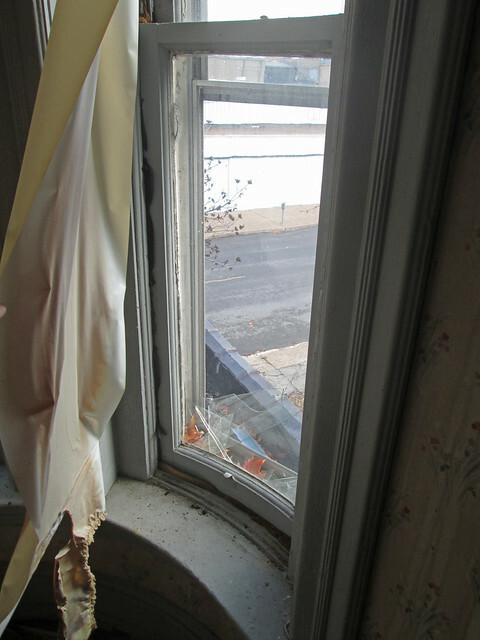 While glass is broken on many, original windows are intact throughout most of the house. 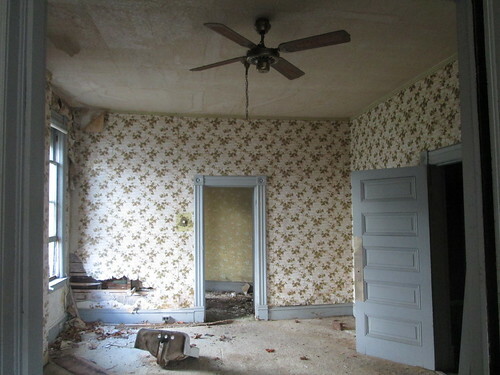 The front room on the second floor. 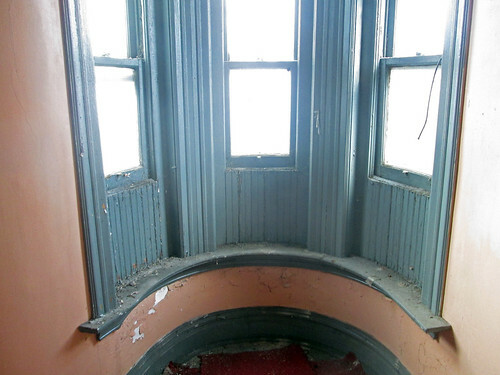 The turret still retains its original windows with curved sash and glass. The pile of glass at the bottom is from the broken storm window. 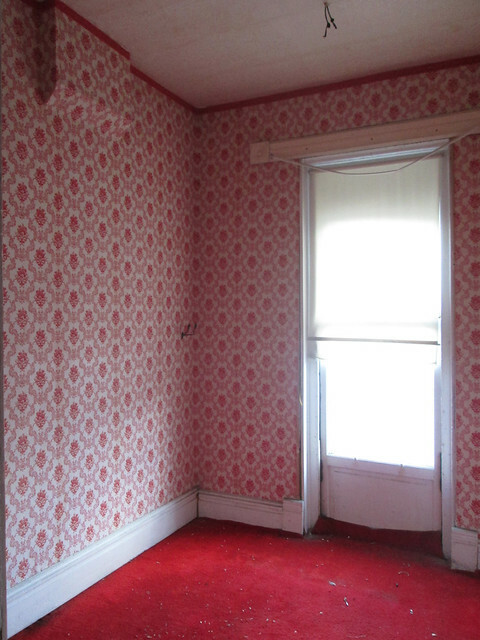 Other than the quirky turreted front rooms, this was my favorite room in the house, complete with fabulous wallpaper and a Jefferson window that likely once led to the roof of the long gone original front porch. 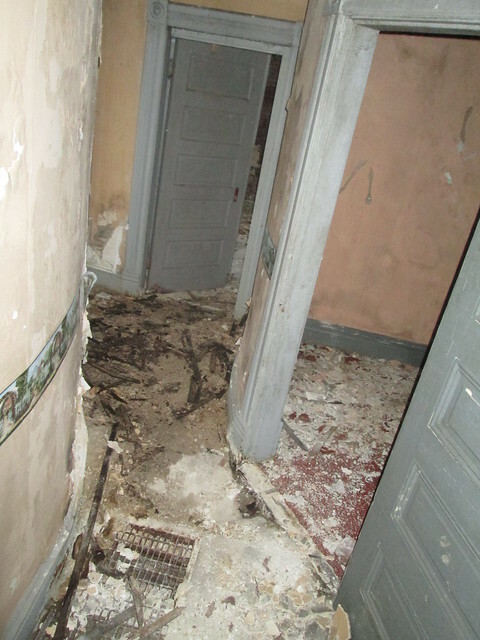 The rear rooms in the flat roofed portion of the house were similarly intact but with some water damage. The only area of major distress was in the small hallway between the rear and center rooms, where the flat and pitched roofs above meet and obviously let in water in greater quantities. 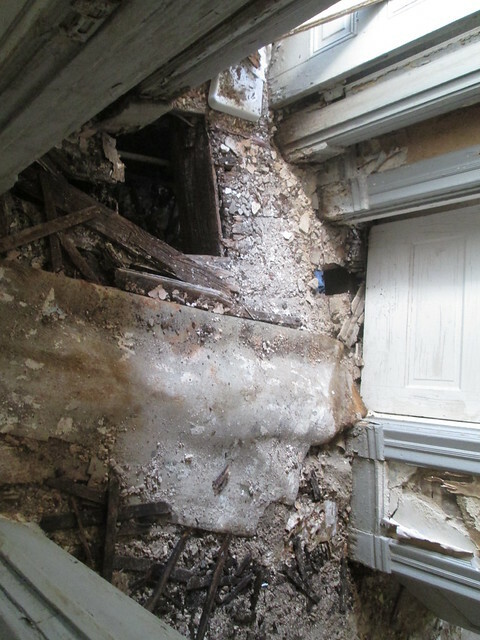 There was a hole in the second floor and in the basement you could see that several joists were rotted out. 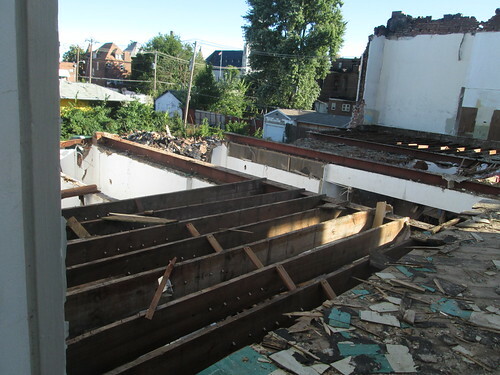 Given the overall condition of the house though, this is an easily repairable situation requiring replacement of the affected joists and sub-floor. A long hallway that runs along the west side of the storefront addition to give access to the street. A small doghouse structure is built up over the stairs to the first floor at the original front door. 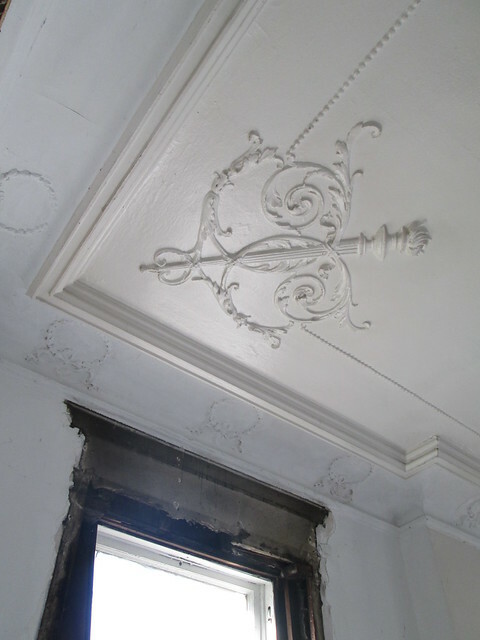 I expected to see the storefronts in bad condition, but found the one that I could access via the basement to be in surprisingly good condition including the plaster ceiling fully intact. Looking back at the passage to to basement. 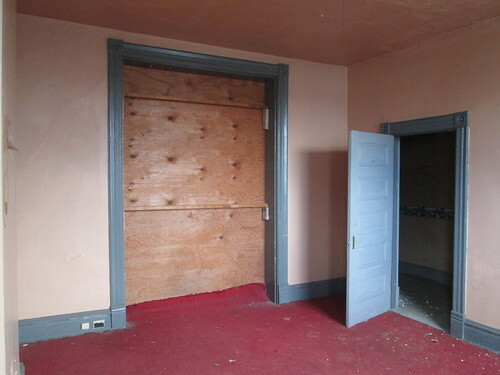 At the rear of the storefront was this oddly modified door leading to a storage closet under the stairs to the entry hall. This stretch of Olive was a dense mix of residential, commercial and institutional uses, which makes the storefront addition seem almost natural. 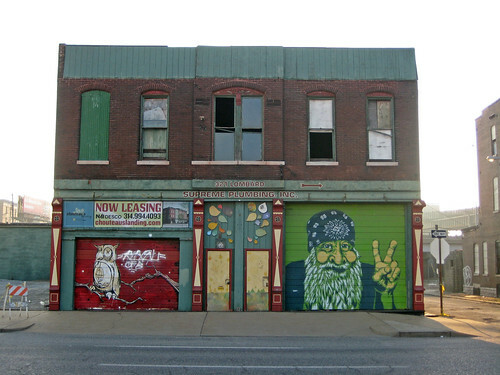 While this building may seem like an oddball today, one of only four left on the block face, it has high potential for re-use as both residential and commercial space. 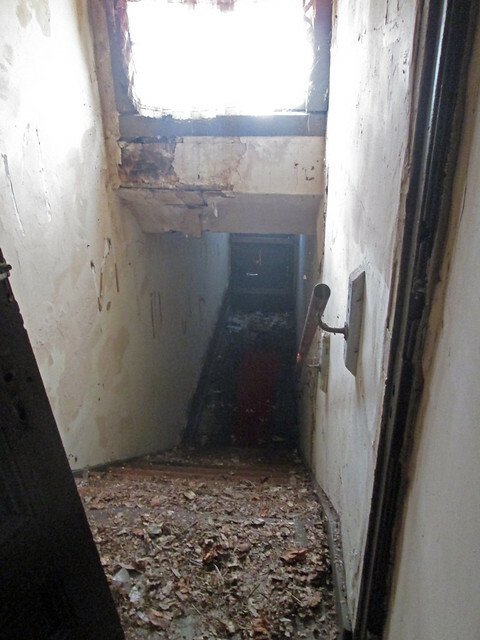 For the cost of demolition, estimated at almost $7,000, a new roof could be put on and the rotten joists replaced, making this a prime candidate for rehab. 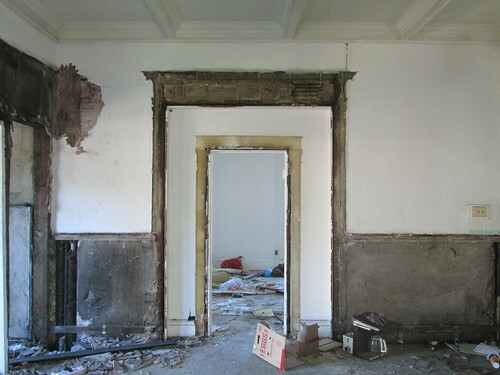 The logic of demolition does not make sense in the current economy. While the area has great potential and Grand Center has long range visions for new residential in this block, developers have not been lining up to build here. Given time, they will, but there is no reason that they cannot build around the existing historic fabric that makes this a great and unique city. 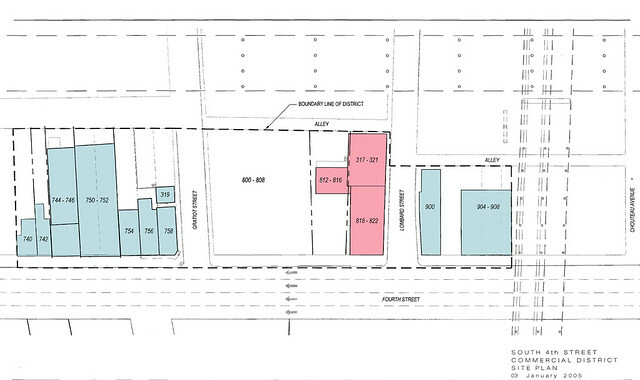 Development here will likely be smaller townhouse groups built incrementally as they are sold or rented, so block long development parcels are unnecessary. Lastly if there is another reason to save this building, its this mural! An UPDATE from my post Monday about the removal of Art Deco Storefronts from the Board of Education Building: The Vitrolite panels are being re-purposed for a restoration of Art Deco era public restrooms atop the Hoover Dam! A story on StlToday yesterday details how Tim Dunn and his company Vitrolite Specialist, Inc. carefully removed the Vitrolite and will be soon heading 1600 miles west to the Hoover Dam with 700 square feet of the black panels. 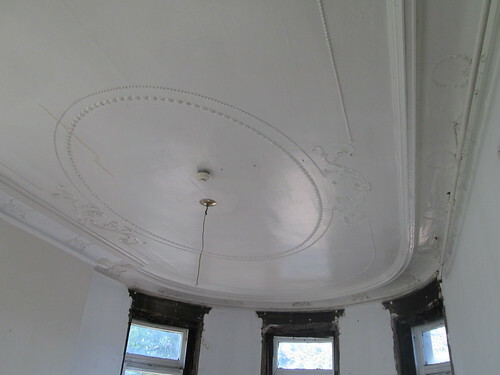 St. louis should be proud that Vitrolite Specialist was chosen by the Department of the Interior because Dunn is the only one with "the expertise, experience and material" to do the restoration. 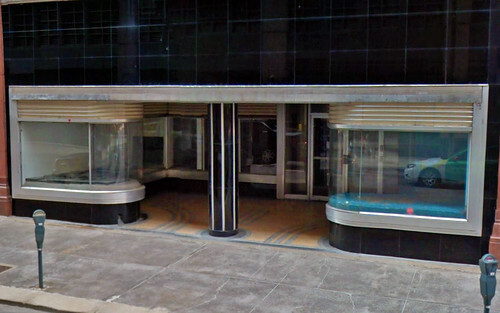 While I'm happy that the Vitrolite is being re-purposed, Downtown St. Louis will end up with a net loss of character with the removal of the Art Deco storefronts. Thanks Ann Aurbach and others for bringing yesterdays story to my attention. 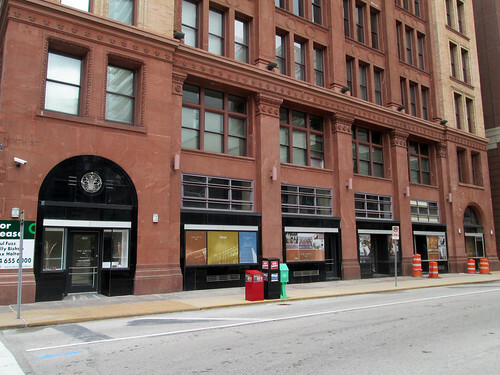 A few months ago, a friend at SLDC gave told me that he had seen a rendering showing new storefronts at the former Board of Education Building at 9th & Locust. Last week workers were busy demolishing what were the most significant and intact examples of Art Deco storefronts in Downtown St. Louis. 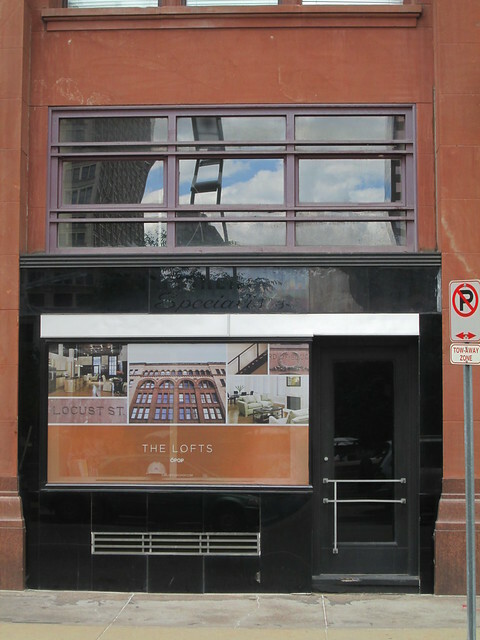 The building, now rebranded The Lofts at OPOP, was purchased last year by Urban Street Group of Chicago as one of a package of several buildings that had been owned by the Roberts Brothers. 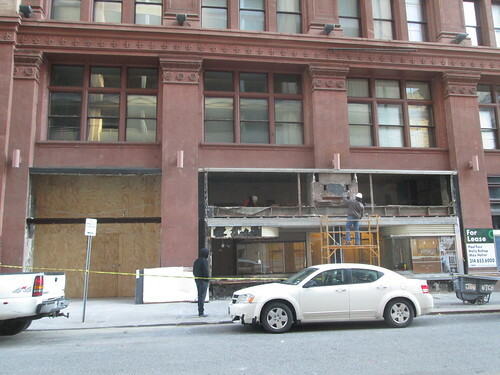 Evidence of the impending changes to come also appeared a few months ago when boards were placed across the opening of the recessed storefronts facing Locust Street. I contacted Betsy Bradley, Director of the Cultural Resources Office to see if the proposed alterations would be reviewed by CRO. 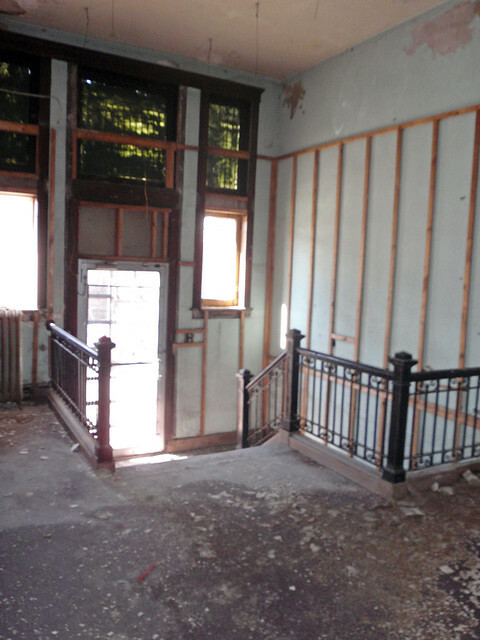 The building is individually listed on the National Register and within Downtown's CBD Preservation Review District. Unfortunately she replied that the Cultural Resources Office would not have jurisdiction over the proposed storefront alterations. 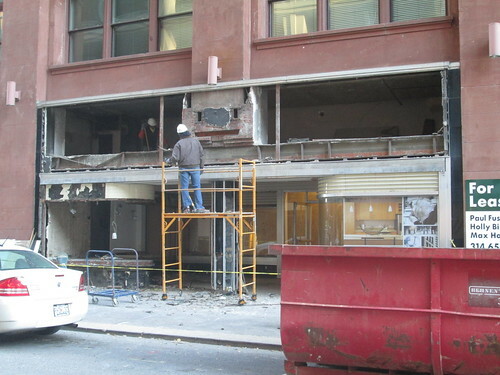 Much of the unique storefront at 905-907 Locust has been dismantled. 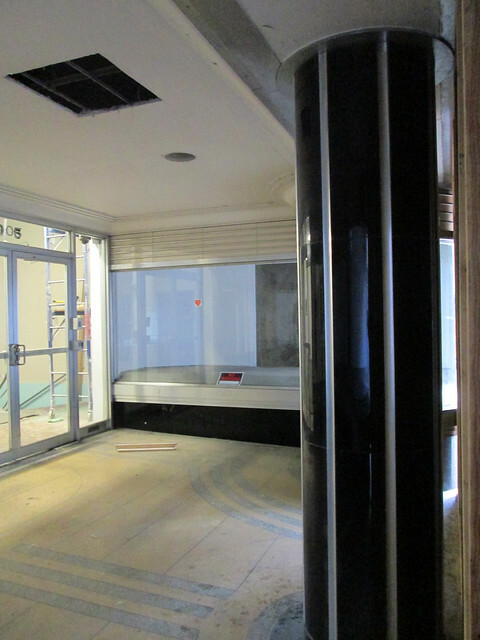 The removal of Vitrolite panels above storefront reveals a mezzanine space above the recessed area. 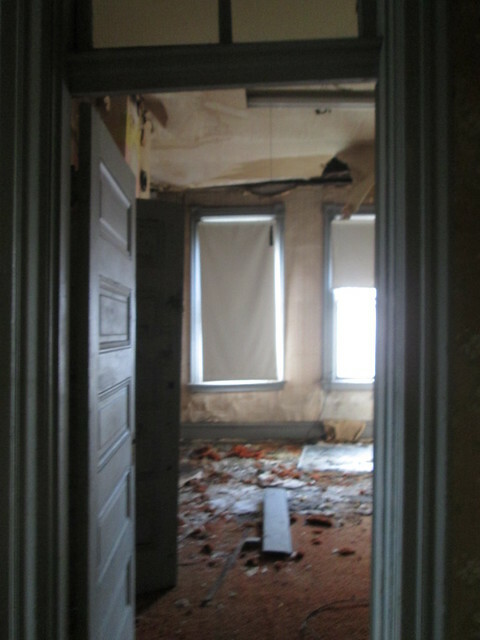 A view of the recessed area prior to being boarded up. 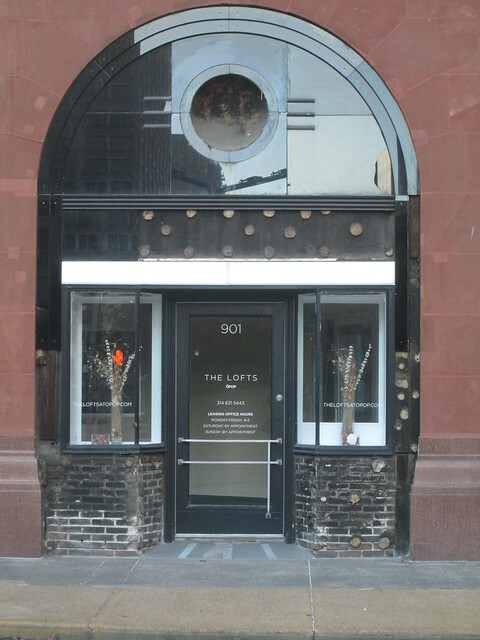 The storefronts were not original to the building, which was completed in 1893, but were well within the building's period of significance, which extended to 1953. 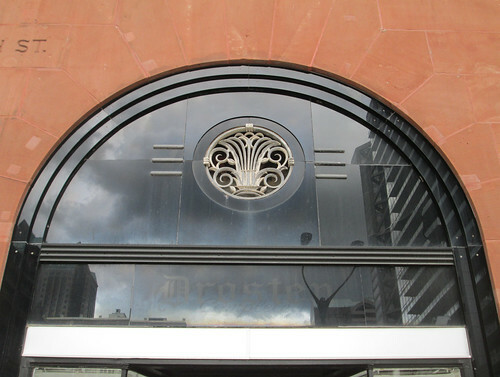 According to the National Register nomination form, the Art Deco style storefront alteration occurred in the 1930's, with the distinctive streamlined two-bay wide recessed area being completed in 1937. 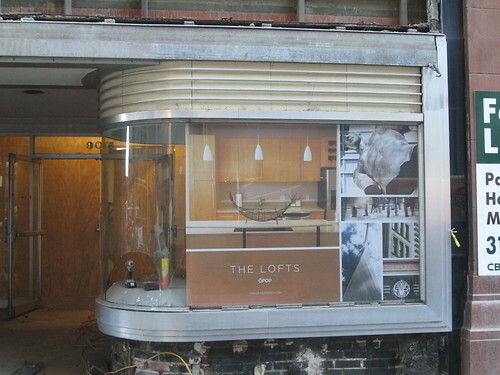 A closeup of the east storefront window featuring curved glazing. Storefront design in the time period from the 1920's through the 1940's was all about making the most of the exterior display windows, and often had deep recessed areas to expand the amount of display space with the intent of drawing shoppers into the store. Debris litters the sidewalk in front of the circular Vitrolite column. A view behind the boards reveals the once bright yellow terrazzo floor with patterns repeating the forms of the curved storefront windows. 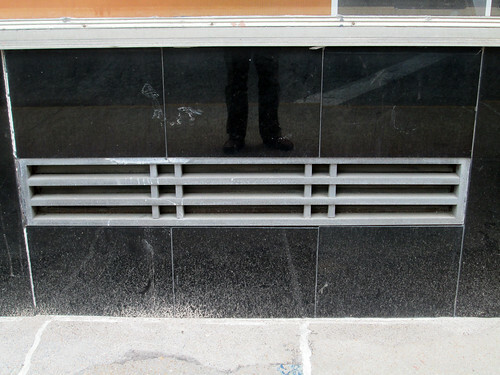 Vitrolite panels have been removed from most of the storefronts along 9th Street as well. The same view prior to removal of the Vitrolite. 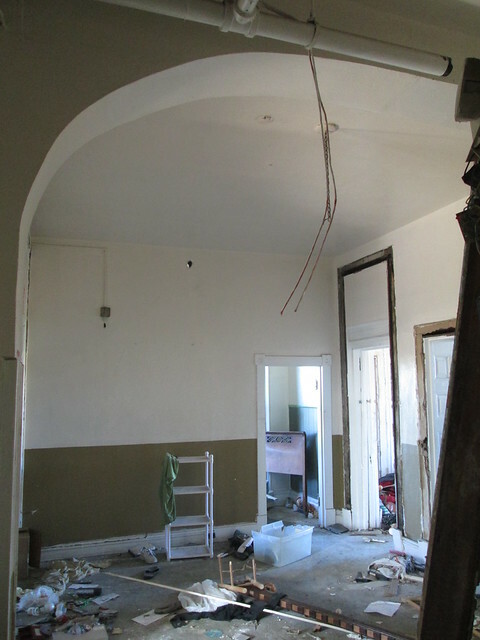 Beside the recessed bays on Locust, the design of the two arched corner bays were the most distinctively elegant. The light band over the door and display windows was a recessed pocket for a retractable awning. A hinged decorative metal band would have covered the pocket when the awing was not in use. 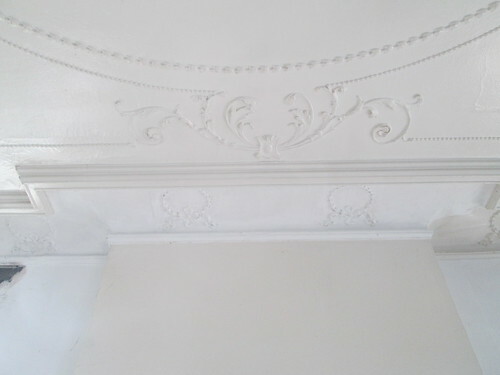 Closeup of the same bay with Vitrolite removed from the lower walls. The faded ghost of the Drosten Jewelry Co. can be seen in this view. The sign was likely cast aluminum letters that were glued to the Vitrolite similar to the small horizontal elements above. 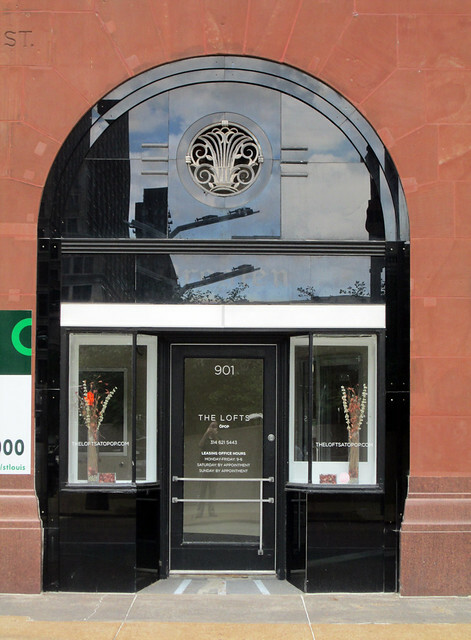 The beautiful circular ornamental grills are now missing from both of the Locust and 9th corner storefronts. Hopefully these will be reused somewhere. I could not find any information online as to what the new storefronts will look like, but I think it is safe to say that they will not live up to what is currently being removed. 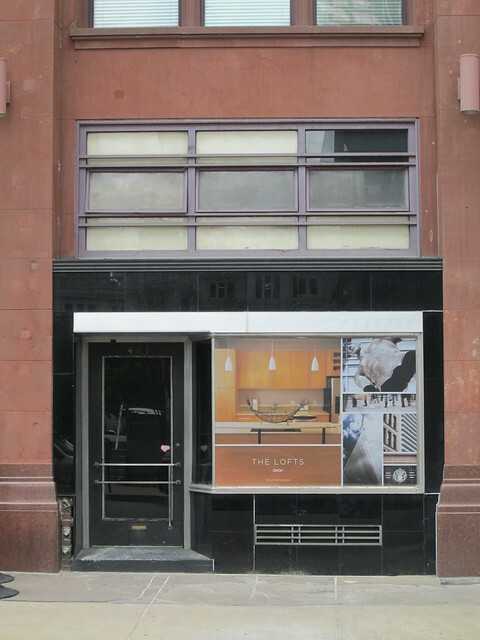 Except for the two bays on Locust over the recessed entrance and the corner former Drosten storefronts, all the other bays had large clerestory windows to let in plenty of daylight. 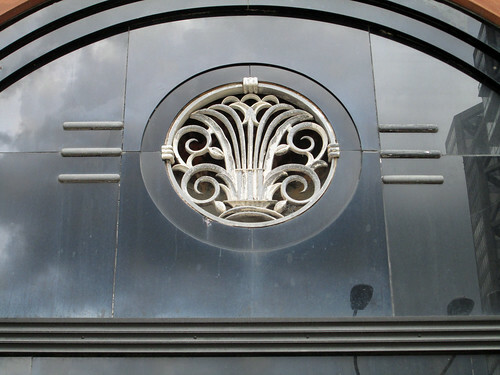 Detail of the decorative stylized grilles. 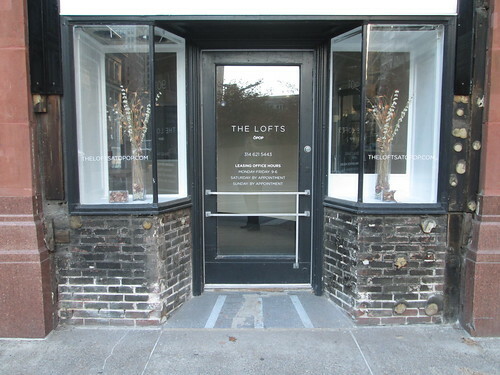 The last storefront on the north end of the 9th Street elevation.